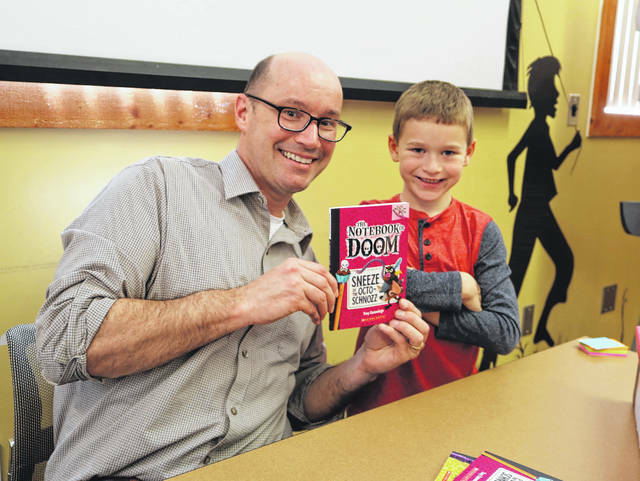 Children’s author Troy Cummings shares a moment with a young library patron during Cummings’ program in May 2016. Cummings is one of several authors the Friends of the Delaware County District Library has hosted throughout its 10 years of service to the library. Members of the Friends of the Delaware County District Library are shown with author and prison reform activist Piper Kerman, back row, third from right, during her visit to Delaware in January 2015. The Friends group is celebrating its 10th anniversary of providing volunteer service and fundraising support for the library. The Friends’ annual meeting is planned for Nov. 2 at the main branch in Delaware. For the past decade, a group of Delaware County residents has offered friendship and support to the staff of the Delaware County District Library. Established in 2007, the Friends of the Delaware County District Library has grown from a small gathering to a strong organization that has donated about $70,000 to the library system during its existence. Stella Dickman was one of the original officers of the Friends. She first became aware that the Friends was being formed when she saw a sign at the Ostrander branch in 2007. The first group of officers to lead the Friends featured Carolyn Flahive, president; Margie Brook, vice president; Dickman, secretary; and Tom Ferguson, treasurer. Penny Mong, Karen Stoner, Maryann Sweeney, David Powell, and Hillary Kline were also members of the initial Friends board. Richard Vail was the project manager. Dickman, a former librarian with the Columbus Metropolitan Library, was elected president in 2010 and served in that capacity until she stepped down in 2016. Karen Cowan is the current president. Cowan said developing public recognition of the Friends has been difficult at times over the years, which is why the organization tries to sponsor public events and members participate with other civic groups. Art sales, featuring pieces donated by local artists, and book sales are two of the established fundraising activities, Cowan said. She noted that the group will debut a unique and dynamic fundraising event in 2018. “Stella has laid the foundation for us to venture out into some other areas,” Cowan said. • First Friends book sale during Delaware Arts Festival in May 2008. • First sponsored program featured children’s author/illustrator Will Hillenbrand in 2008. • Hosted children’s author/illustrator Richard Cowdry at Powell Branch in 2009. • Paul Gaus, author of Amish murder mysteries, featured at annual meeting in 2010. • Developed the Friends website in 2011. • Offered Stories Alive storytelling festival for families in 2012. • Book donations to Delaware County Jail, Children’s Hospital, Boy and Girl Scouts, elementary schools, and Lewis Center Rotary in 2013. • 87 volunteers donated 1,000 service hours to the library in 2014. • Started Friends Facebook page in 2015. • Hosted author/prison reform activist Piper Kerman at Ohio Wesleyan University in 2016. The Friends of the Delaware County District Library annual meeting on Thursday, Nov. 2 will wrap up the anniversary celebration. Newspaper columnist Joe Blundo will be the guest speaker for the event, which will include entertainment, giveaways, and a birthday cake. The annual meeting will be held at 6:30 p.m. on Nov. 2 at the main library’s community room, 84 E. Winter St., Delaware. Cowan said the meeting is open to the public. Visitors who become members of the Friends of the Delaware County District Library during the annual meeting will receive a free Friends book bag.